10 different pictures: valentine, kiss, roses, heart with wings, chocolate covered heart, heart key, butterfly, box of chocolates, diamond ring, and cupcake. Level 1 - Create the picture by placing your building bricks directly on the color picture on the page. Then write down how many of each brick was used & circle the color you used the most of. Level 2 - Create the color picture by placing your building bricks directly on the black and white picture on the page. 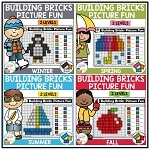 You can also have your students color the bricks on the page before placing the building bricks on the picture. Then count how many of each size brick was used. You can also build these pictures on a brick building block plate. Print on heavy card stock and laminate. This is a fun hands-on fine motor skills activity.